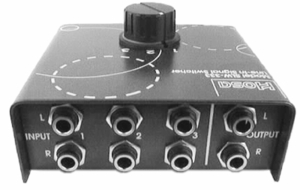 Hosa SLW-333 AUDIO SIGNAL SELECTOR, 1 IN TO 3 OUT, OR 3 IN TO 1 OUT Switch back and forth, noiselessly, between up to three powered monitors. The versatile design has 1 IN (source) and 3 OUT (destination), but can be used in reverse to give you 3 IN (multiple sources) to 1 OUT (a single destination). The SLW-333 provides 1/4" Tip-Ring-Sleeve (TRS) phone jacks for easy connecting.